By insuring your classic, antique or collector vehicle on a separate policy, we can provide better coverage at a significantly lower rate, than daily driver policies. This being said, Classic and antique vehicles are meant to be driven. 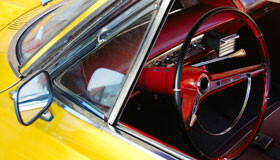 Whether you are going to an auto show, or just taking it out for a cruise, let us help you protect your investment. Guaranteed Value (agreed value): We agree on a value, and in the event of a covered total loss, the client is paid that full amount-less any deductible or salvage value, if retained. A Broad Range of Vehicles: including classics, modified cars, vintage racecars, motorcycles, boats, pickups, and more. Freedom: to enjoy your vehicle to allow for pleasure and hobby-related usage with no fixed mileage limits.